This article teaches you all about checking an email account in Thunderbird. We will only need to create a mailbox in Thunderbird. Below are the step by step instructions. You will need your email settings to complete this guide. You can view your email settings in cPanel at any time. You will need to know the servername to the email company you are using. 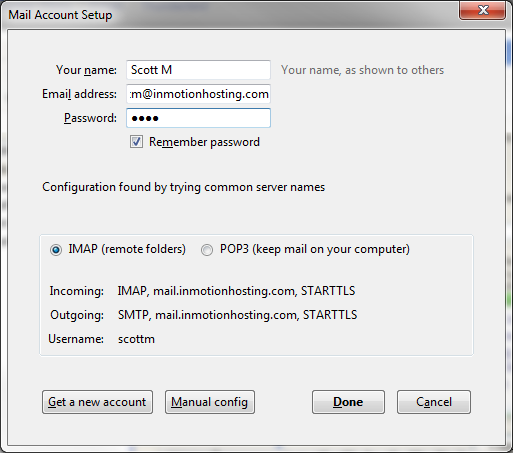 InMotion servers use mail.servername.com. Others may use imap.mail.servername.com or pop.mail.servername.com, which are fairly standard. 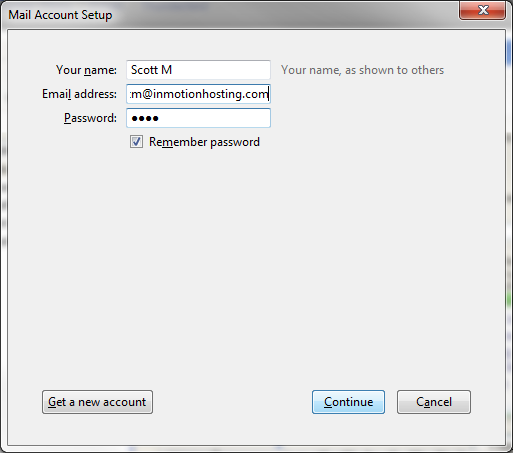 Not used for InMotion Hosting Servers. Security Protocol not supported by InMotion Hosting servers. If you did selected the normal (unencrypted) settings, you will be presented with a popup telling you that the email connection to the server is unencrypted. You can check the I understand the risks checkbox and then click the Done button to continue. I have set up thunderbird as my email client using uk2 as the email host.When I send an email from my email to a separate (personal) gmail account of mine I get a question mark by my sender name, which provides a pop up basically saying that gmail cannot verify that [my domain] sent the mail and not a spammer. How do I prevent thus happening please? Ensure you have spf/domain keys set up for your domain, as well as DMARC records. Just installed T and, set up an existing GoDaddy hosted email configured as POP. Chose to import All. 10,670 emails properly (more or less) imported from Inbox. 11, 200 Sent messages didn't download. Can't figure out how to do it. HELP! If you are trying to have all of your email stored locally on your computer then using POP3 is the best protocol to use. If you're having problems getting the email to download from the server, then you need to speak with your hosting service. If you're hosted with InMotion Hosting, then contact our live technical support team in order to get immediate assistance. You can also reference one fo our articles for moving email using Thunderbird or checking out the Mozilla FAQ on Importing and Exporting with Thunderbird. I did fallow all your isntructions to configure my E-Mail with thundenberd but I can not get to send or receive mails. You may want to check out our full guide on general email troubleshooting. Trying to be careful because of ransomware. When sending message to new account, I'm getting a request to add a security exception to Thunderbird (mail.wsrl.org:587). How can I tell if this is a necessary, needed and valid request? This is most likely because you are trying to connect securely via your domain "wsrl.org" and I do not see an SSL installed for it. You can still connect securely without an SSL, but you will have to user secure server setting for your email. You can view your specific Secure SSL/TLS email settings in cPanel. On my desktop, my Thunderbird account is set up as POP3. I want to set up IMAP on my laptop, but TB says it can't find that configuration. I am changing the port to 993 as recommended in the instructions, but it doesn't seem to work. I would try adding a new account with POP selected from the beginning. That worked! I created the IMAP account, made sure I had everything I needed from the POP account, and then deleted the old account. Seems to be working fine. Sorry for the problem with the email password. You should be able to login to cPanel, find her email account and reset the password . If you are unable to do that, then you will need to contact our live technical support team and then request help with the email login. Hi, I am having same problem as Sarah Archambo above. I have changed my settings to non-secure, and I still receive the same error message when trying to send messages. In fact, I have tried many different variations of settings - same result every time. Any suggestions on what to do? As a test, try performing a Ping/Traceroute to your mail servers. You can also review the mail logs for additional errors or record of your connection. You can read them to see where the issue lies. Or you can submit them to your Live Support team and they can take a look for you. How to close this window? Nothing not work, i can't check emails, the window of that i can't close. Menu bar i can't open also and go to acount. What to do? Thank you for contacting us. Sorry, but it is not clear what issues you are experiencing. Please provide additional details, so we can replicate the problem. Lately when I try to send an e-mail I immediately get a message that says "Sending of message failed. The message could not be sent because the connetio of Outgoing Server [SMTP] secure153.inmotionhosting.com timed out. Try again." This happens instantly - it's not like anything sits running then times out. Sorry for the problem with the outgoing emails not working. I would recommend changing the settings to the non-secure settings for now (find your email settings). You can double-check the secure settings and make sure it's using the SSL/TLS (not STARTTLS) and port 465. Otherwise, you can use the non-secure settings where the port 587. Authentication should still be based on password and user name (which is the email account). 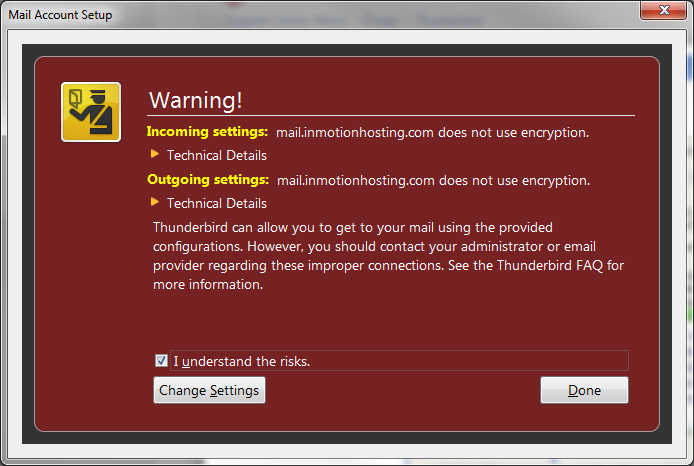 Thunderbird gives free email service but faces several limitations with respect to MS Outlook. For thunderbird users, migration is quite easier towards MS outlook. It can be done through advanced converter tool like Stellar MBOX to PST converter software. Thank you for your suggestion. Feel free to submit a Post in our User Submitted section, and we can link to it. If you have any further suggestions, feel free to post them below. when i am adding my account to thunderbird it says incorrect username or password, since i can login to my account via webmail directly. i am using ubuntu 12.04, is any problem with this version or somthing else. Be sure that you are using the exact same credentials that you are able to log into webmail with. This can sometimes also be caused by reaching the incorrect server. Check over your server settings to ensure that they are correct. Make sure you are using the full username. For example, "joe@example.com" instead of just "joe". This is a common cause of authentication errors. 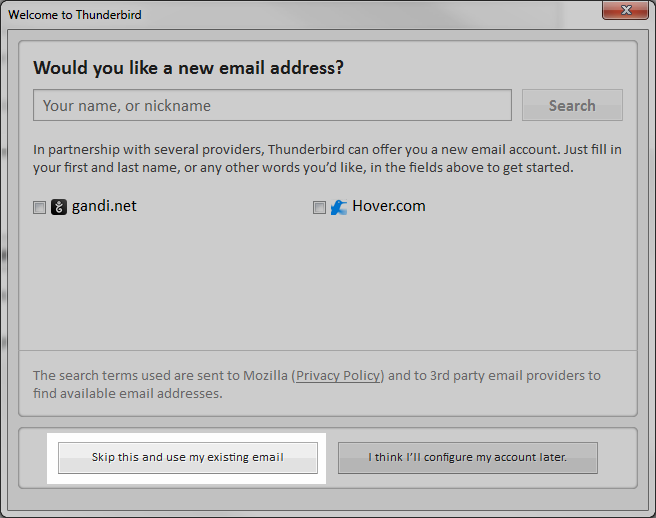 I've tried over and over to have thunderbird accept my gmail account. When the screen comes up that asks for my user name, email address and password I get the message either email address or password are incorrect. I think I have all the settings rigght and I definitely have the correct info about my email address and password. What am I doing wrong? Thanks for your help. I was able to connect Thunderbird to my gmail account without issue. Have you logged into the gmail account with that specific email address and password? If so, what are the other settings you have configured in the setup (no email address or password, please). Please let us know if you are still having any issues at all. Where do I find this information? "You will need to know the servername to the email company you are using. InMotion servers use mail.servername.com." If you have your domain pointed to our nameservers, you would use mail.YOURDOMAINHERE.com. This ensures that as long as your domain is pointed here, your mail is as well. Thanks. I followed the guide/instructions, and I am getting the message "configuration could not be verified." (Step 6) I think the server name I am using is incorrect. Advice on what to do next? The Thunderbird configuration could not be verified error typically happens when you aren't using the correct email address and password. 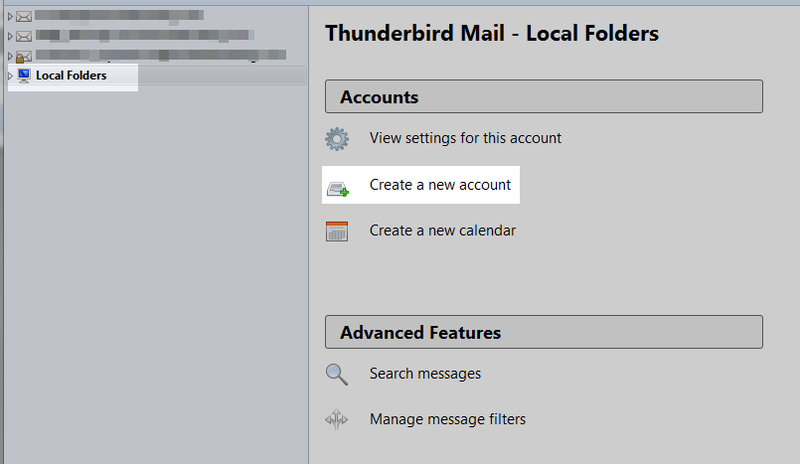 Are you able to login to webmail using the same account you're trying to setup in Thunderbird? You also want to make sure that you are entering in your full email address such as user@example.com and not just using user. Of course replace YourDomain.com with your own domain name if using that one. You can change an email account password if that seems to be the issue. Please let us know if you're still having problems.